pet health | Live Healthy S.C.
World Rabies Day is September 28th and is a global health observance that seeks to raise awareness about rabies and enhance prevention and control efforts. Rabies is a deadly virus that kills pets, wildlife and people across the globe. Rabies education and vaccinations are the key to #EndRabies. 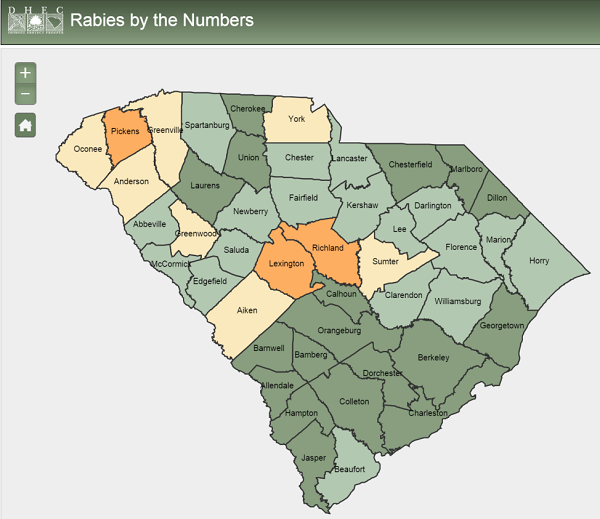 The SC Rabies Application provides statistics of rabies cases by county, species and year. Rabies (Lyssavirus) attacks nerves in the spinal cord and brain and can be passed to a healthy person or animal via exposure to saliva or neural tissue from a rabid animal. 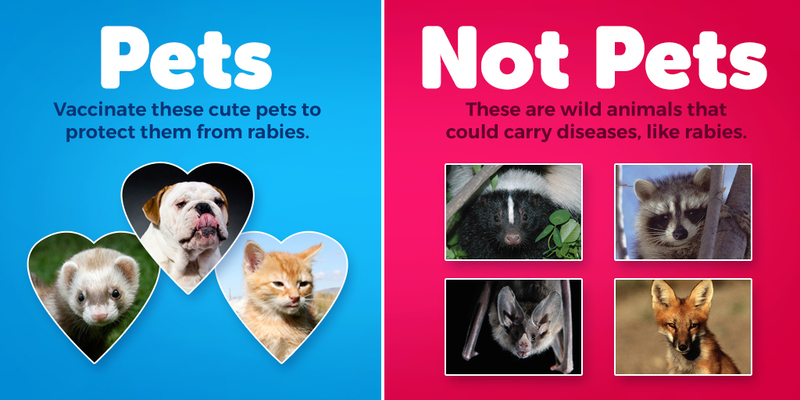 In South Carolina, rabies is most often found in raccoons, foxes, skunks and bats, but pets contract the virus as well. As of September 15, there have been 96 confirmed rabies cases in South Carolina this year. There were 139 cases in 2014. You can view rabies statistics across the state here. Join us in the fight to #EndRabies by keeping your pets up-to-date with their rabies vaccinations – which protects not only your pet, but also you and your family from the virus. 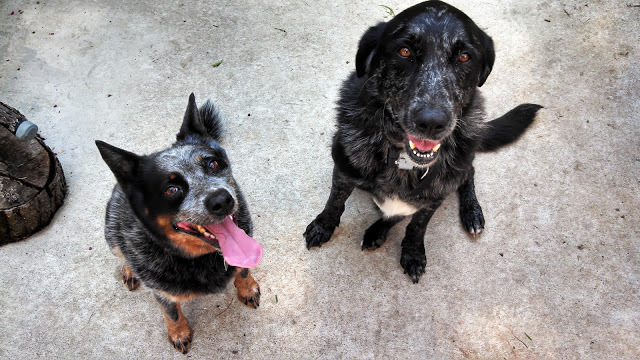 Check out DHEC’s World Rabies Day 2015 album on Facebook or Flickr. Avoiding wild animals, particularly ones that appear to be injured, tame or behaving abnormally, and teaching your children to do the same is a great way to protect your family from rabies. If you see a wild animal that seems sick, contact your local animal control office, veterinarian, or wildlife rescue/rehabilitation group for help. Do not handle wildlife or strays and keep them away from your family pets. You can learn more about rabies symptoms here. Rabid bats have been known to transmit the virus to humans and pets. People – especially children – sometimes don’t realize they’ve been bitten and it is very easy to overlook a bat bite because bat teeth are so tiny. If you find a bat in a room, a tent or a cabin where someone has been sleeping, with elderly or incapacitated persons, or where unattended children have been playing, always assume the bat could have bitten the person. Bats that have the potential to have been in contact with people, their pets or livestock should be safely trapped in a sealed container and not touched. Call your local office to report the incident. If you’re bitten or scratched by a wild, stray or unvaccinated animal care for the wound properly and contact your health care provider immediately. The health care provider is required by the Rabies Control Act to report the incident to DHEC. If you or your child is bitten, scratched or otherwise exposed and you do not seek medical treatment for the wound, you are required by the Rabies Control Act to report the bite to DHEC by the end of the following business day. Please visit our map for contact information for the Environmental Quality Control office in your area. For more information on rabies, visit www.scdhec.gov/rabies. World Rabies Day is co-sponsored by the Centers for Disease Control and the Alliance for Rabies Control (ARC). This entry was posted in Disease Control and tagged disease prevention, pet health, rabid animal, Rabies, vaccines, wildlife on September 28, 2015 by SC DHEC.